When I started thinking and talking about this project last summer, Monique DeVries was the first person to volunteer to take part. When we made a date, she asked if her husband, Ron, could also cook a second recipe, I couldn’t say no. I had no idea what we were making when I arrived at their house on a sunny Saturday afternoon in late February. Ron and Monique welcomed me into their home for the first time, and they were prepped to take on two popular Dutch treats: oliebollen and boterkoek. Whenever I talked any Dutch person about this project the most common question I heard was: “Are you going to do oliebollen?” “You have to do oliebollen!” Since I had relinquished control over the type of food my participants would make with me, I could only shrug and say I wasn’t picking. So when Ron said we were going to make oliebollen, I was quite excited. My family had never made it so we only got some when we were at a New Year’s event with Dutch friends. It’s been a long time since I’ve seen oliebollen, let alone fresh, hot oliebollen, and I’ve never made it. Because we oliebollen has a yeast starter, Ron suggested that we start the oliebollen, move on to boterkoek and then finish the with the oliebollen. 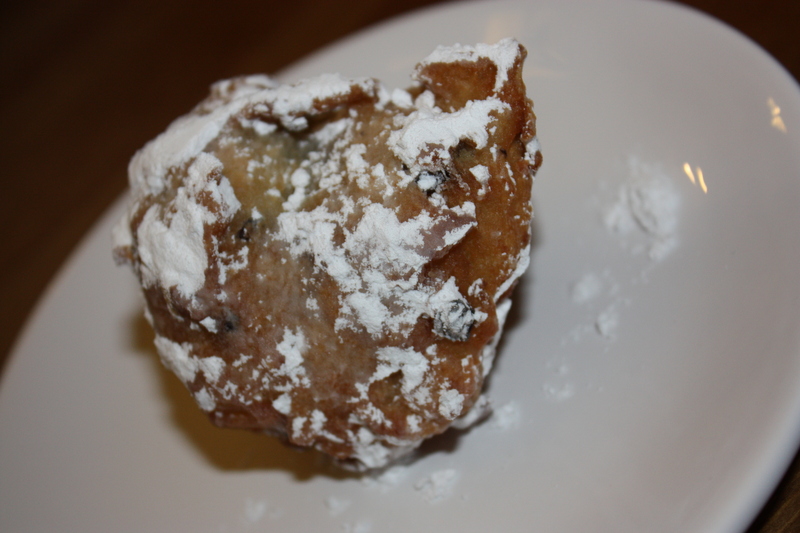 Oliebollen is a family recipe for the DeVrieses. 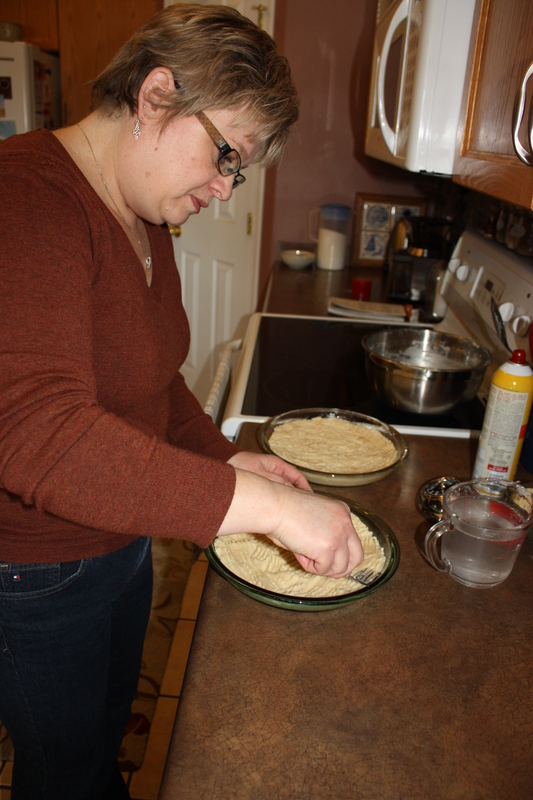 Ron’s mom would make them every year when they still lived in Exeter, Ontario. When they moved to Alberta, Ron had to take up the deep fryer and continue the tradition. “That’s why I am doing this with you,” Ron says. “Eventually I would like to pass on this incredible responsibility, this incredibly powerful responsibility to our son over there.” He gestures to his adult son sitting nearby, visiting for the afternoon—perhaps because of the coming oliebollen. His son laughs but admits, up to this point he hasn’t ever made oliebollen either. 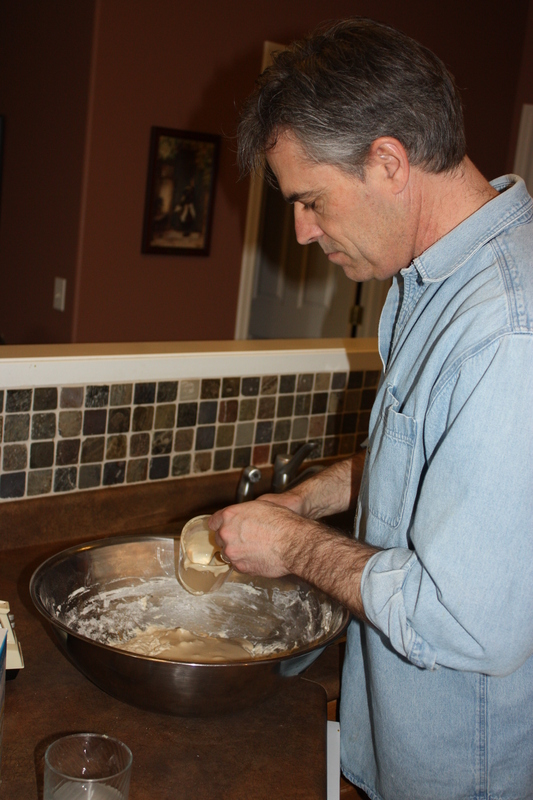 As we work on the oliebollen, Ron talks about some of his work as a a youth pastor for the Christian Reformed Churches in Northern Alberta. “One of the senses we don’t usually key in on when we do this church services is the sense of smell,” he says. “It’s a memory sense.” Ron suggests that we could bring that sense into the church through communion and engage the congregation with another sense. We already eat the bread during the sacrament, “Why don’t we have that memory of the bread baking inside the church and as soon as you coming in you smell it?” he asks. I picture walking into church, or any place permeated with the smell of bread baking in bread makers positioned around the sanctuary. I don’t have to be convinced—in fact I volunteer to help prepare the bread. Ron believes that anytime we gather around food to eat together we are building our communities whether it around our culture, faith, friends, or family. With the starter for the oliebollen done and sitting, covered in the sun, rising for the next ninety minutes, Monique starts to make the boterkoek. “This recipe makes two so you have one to give away and one to eat,” she tells me, “but Ron always says I give them away more than I keep them.” They both laugh. I can understand; you don’t want to smell the almondy scent of baking boterkoek than have it disappear before you get a taste. I ask them both if they feel like they are Dutch or Canadian. Monique answers first, “I think Dutch,” she says. She says that often when she is in a group who isn’t Dutch, she realizes how many little things that come up that relate to her Dutch heritage. “When I talk about stuff at work, often Dutch things come up. You might talk about your Oma, but then you think ‘These people are Canadians so it’s your grandma.’ ”. Both Ron and Monique notice a difference in the Edmonton community from the Ontario community where they grew up. “It’s certainly different where we were in Ontario because there were a lot of first generation immigrants.” The Dutch community in Edmonton goes back 100 years with a last large influx in the 1950s. In Ontario, the community took root more in the 1950s and there was a continuing arrival of Dutch immigrants which keeps the connection to Holland closer. With the boterkoek in the oven and the oliebollen still rising, we tour around the DeVries’ home looking at their Dutch items. 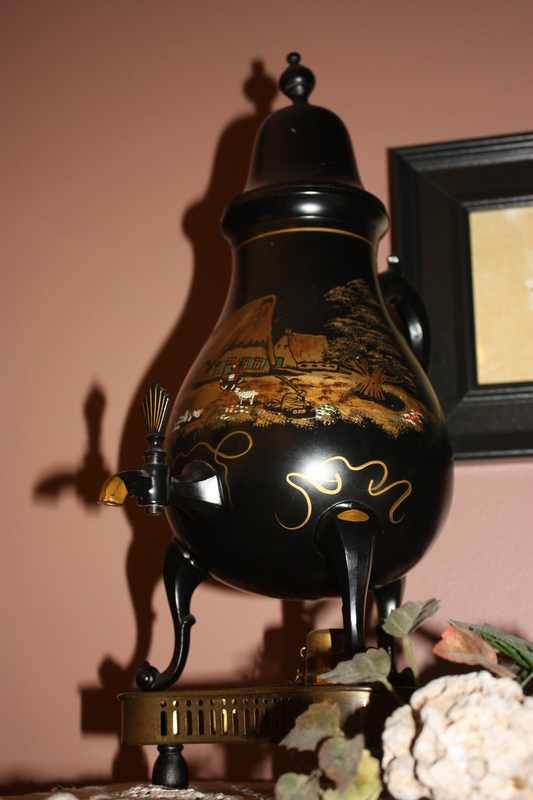 An old, decorative coffee maker that is heated with a Bunsen burner is displayed in their living room. Ron brings out an intricate Dutch clock from his parents. There is of course a little Delft blue tile tray made by Ron’s uncle, and a table with a familiar image of a man making klompen (wooden shoes) made by Monique’s grandfather. 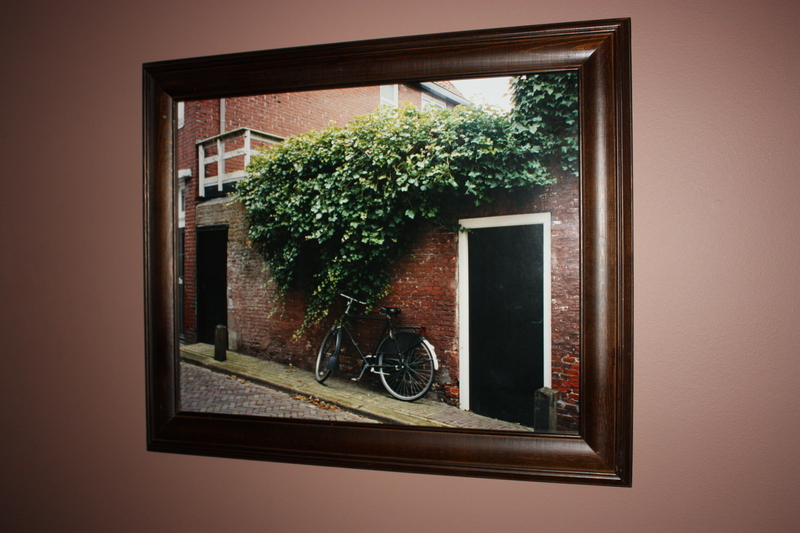 As we walk up the stairs there is a striking picture of a Dutch bicycle leaning against a vine-covered wall. Monique tells me her mom took it on one of her visits home to Holland. “Everyone who sees it likes it and then my mom has to print another copy,” she says. When we are done our tour and a cup of tea, Monique pulls the golden boterkoek out of the oven to cool and our oliebollen batter is ready to go. Ron kneads in grated apples, raisins, and currents. Then we go out to the deck where the deep fryer is waiting. Ron shows me how he shapes the balls with two spoons and drops them in. 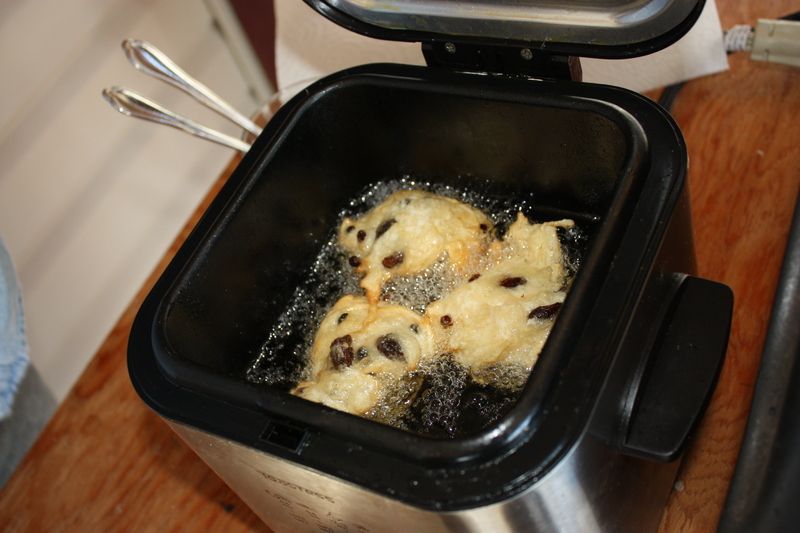 Oliebollen means literally oil balls, they sizzle and the smell of oil and baking pastry fills our noses. When the first batch is ready, Monique, her son, and I heartlessly leave Ron to the frying and we wait as long as we can before we grab a hot oliebollen and add a dash of powdered icing sugar. Fresh oliebollen is crispy on the outside and soft inside. While they do keep, this is the best way to eat them: immediately. While we eat, the DeVries’ son and I talk about sharing our heritage with our non-Dutch spouses and the aspects we like about their cultures—his wife has a Polish background and my husband was born in Britain. We talk about food, of course and he tells me that his wife’s family make amazing perogies. This seems to me to be the Canadian way, mingling the best parts of different cultures to form our own hybrids.